The Citterio 98 collection have earned it the status of a modern classic. Drawing influence from traditional restaurant cutlery, the matt brushed stainless steel design feels equally at home in both a formal dinner setting and at a relaxed get-together with friends. Contemporary classic. The bold, distinctive design and generous proportions of the Citterio 98 collection have earned it the status of a modern classic. Drawing influence from traditional restaurant cutlery, the matt brushed stainless steel design feels equally at home in both a formal dinner setting and at a relaxed get-together with friends. Born in Meda, Italy, in 1950, an internationally renowned designer and architect, Antonio Citterio has won many prizes including the Compasso d’Oro in 1987 and 1995. He has carried out a range of striking design and architecture commissions for companies like B&B Italia, Kartell and Vitra and his products are part of the MOMA permanent collection and the Centre di Pompidou in Paris. 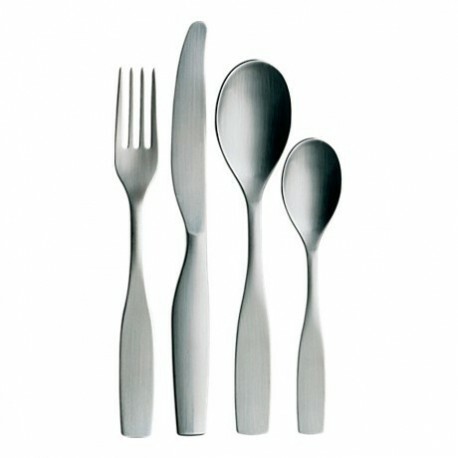 The Citterio 98 cutlery and the Collective Tools series were designed together with Glen Oliver Löw, who started working with Citterio in 1987. Decanter was created in association with Toan Nguyen.